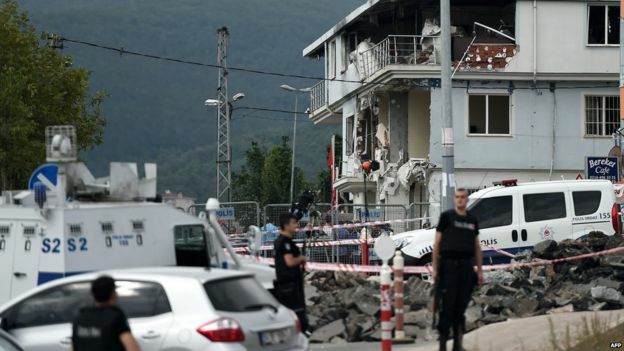 Six members of the security forces have been killed in a series of attacks in Turkey amid rising tension between the government and Kurdish militants. Turkey had been bracing itself for retaliatory attacks since it started to conduct operations against the so-called Islamic State and the Kurdish PKK militants last month. In the last couple of weeks more than 20 security officers have been killed, by attacks mostly blamed on the PKK. Today has been one of the most violent days. In four different attacks, nine people were killed - six of whom were soldiers or policemen. As yet no connection has been made between any of these attacks. The prime minister and the main opposition leader held coalition talks on Monday evening. The opposition leader said it was time for politicians to get together and find a solution to this violence. Whether that will be possible is a question that is haunting many people in Turkey. In Sirnak province, four police officers were killed when their armoured vehicle was hit by roadside explosives in the town of Silopi. A soldier was also killed when suspected Kurdish militants fired on a military helicopter as it was taking off in Beytussebap district. At least seven other soldiers were wounded. Later Turkish media reported simultaneous attacks on police and military headquarters in the town of Lice in Diyarbakir province. There were no immediate reports of casualties. Following the helicopter attack, Turkish helicopters bombed Kurdistan Workers' Party (PKK) targets in retaliation. A ceasefire in the long-running conflict with the group appeared to disintegrate in July, when Turkey began bombing PKK camps in northern Iraq, at the same time as launching air strikes on Islamic State (IS) militants. PKK leader Cemil Bayik has accused Turkey of trying to protect IS by attacking Kurdish fighters. "They are doing it to limit the PKK's fight against IS. Turkey is protecting IS," he told the BBC in an interview. Kurdish fighters - among them the PKK - have secured significant victories against IS in Syria and Iraq. But Turkey, like a number of Western countries, considers the PKK a terrorist organisation.